If you've upgraded to Google Analytics 360 for your website, you're probably dealing with millions of visits on a monthly basis, and handling volumes of data on that scale can quickly become a housekeeping nightmare and that in turn affects the integrity of your data. Also extracting relevant subsets data can quickly become complicated and time-consuming. If you've had to do an audit on a large account before you'll know exactly what I'm talking about. Thankfully Google has looked to address this issue with its new BigQuery support built into analytics. What is Google Big Query? BigQuery is Google's serverless, highly scalable, low-cost enterprise data warehouse designed to make all your data analysts productive. Because there is no infrastructure to manage, you can focus on analyzing data to find meaningful insights using familiar SQL, and you don't need a database administrator. BigQuery enables you to analyse all your data by creating a logical data warehouse over managed, columnar storage as well as data from object storage, and spreadsheets. BigQuery makes it easy to securely share insights within your organisation and beyond as datasets, queries, spreadsheets and reports. BigQuery allows organisations to capture and analyse data in real-time using its powerful streaming ingestion capability so that your insights are always current. Since Google's latest product update Analytics 360 now supports integration with Google BigQuery and now gives analysts the opportunity to glean new business insights by accessing session and hit level data and combining it with separate data sets. Organisations and developers can analyse unsampled analytics data in seconds through BigQuery, a web service that lets developers and businesses conduct an interactive analysis of big data sets and tap into powerful data analytics. To help users get practical experience with analysing analytics data in BigQuery, Google has also announced the availability of a Google Analytics sample dataset. 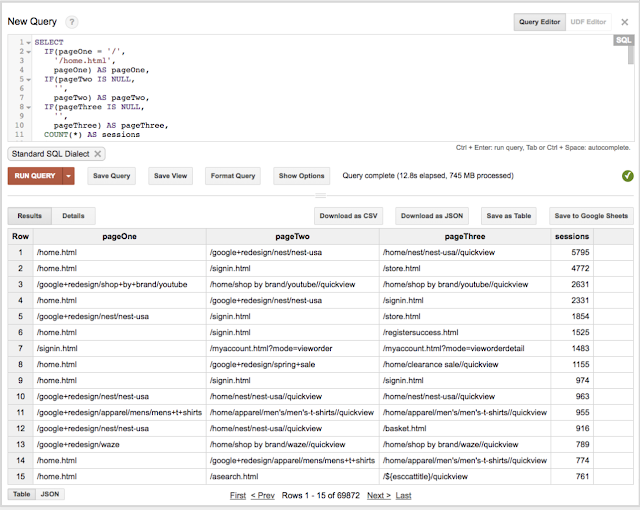 This is accessible directly through the BigQuery interface. The dataset includes data from the Google Merchandise Store, an E-commerce site that sells Google-branded merchandise. The typical Google Analytics 360 data you would expect to see such as AdWords, Goals and Enhanced E-commerce data can be queried. If you’re an educator or manager trying to teach others to use BigQuery, then you can use the sample data to create task-based assessments and other learning materials for your students or staff who would benefit from it. Big Query will not only give you easier access to critical data points, but it will provide you with new and exciting ways to analyse it and take advantage of trends that would have otherwise gone unnoticed.